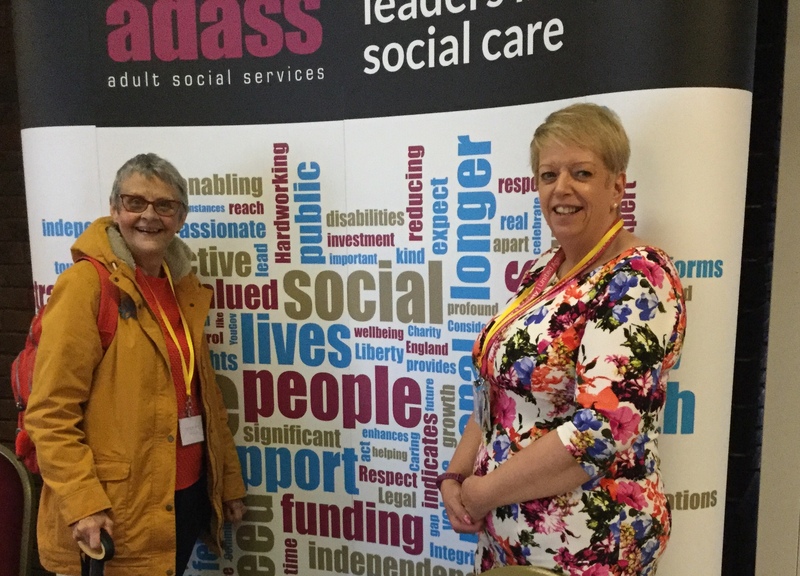 Addressing Directors of Adult Social Services….. | Which me am I today? 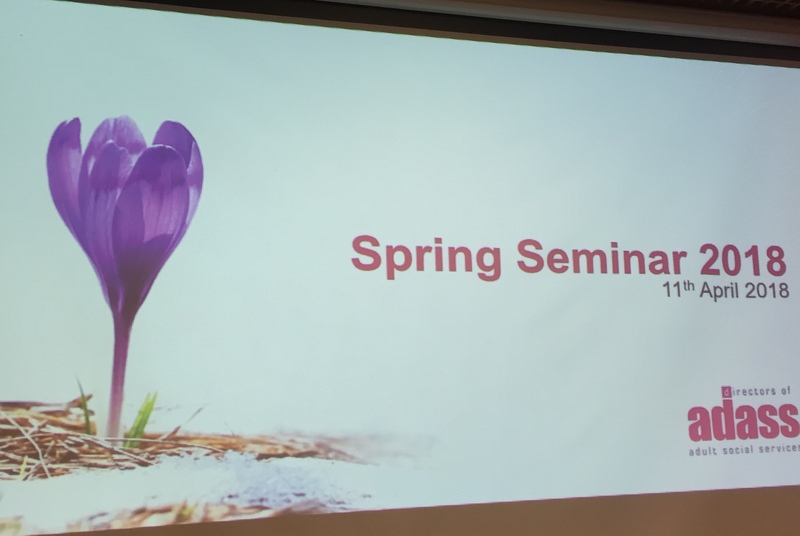 Addressing Directors of Adult Social Services…..
A while ago Jeremy Hughes had asked if I’d speak at the annual spring seminar for Directors of Social Services. Apparently it’s very hard to get an invite to this as it’s not a public meeting but due to the centrality of dementia to the current social care crisis, they invited me to address the Conference in Stafford. Some of the focus of their conference will be on the Prime Ministers Challenge on Dementia and The Government Green Paper on Social Care, so only right someone with dementia was there. I’m never sure how much of the message they listen to at these type of meetings but I was prepared to give it a go and make sure my message was loud and clear. I’ve had 3 very enjoyable but busy listening and speaking days so I’d had a banging headache since day one – a simple side effect from the effort that goes into listening and speaking! But on Tuesday night, during my sleep, wake, sleep, wake routine of the dark, I woke up at midnight to find my head clear and bright! It felt like spring had arrived in my head after a bad storm. I almost wanted to get up to enjoy it in case it didn’t last😂…..but I needn’t have worried as I woke to find the sun has disappeared but at least the storm had stopped banging about in my head.. I wasn’t due to speak until 4.30….it will be interesting to see how many have left before I get up and speak. I arrive at 12 so I’ll be able to see…….the events lasts for 3 days so maybe some of what I say will register as I’m at the end of the first day…. Helen Foster, Director of Operations was due to meet me at the station and look after me for the duration as I needed to stay overnight due to speaking so late. Helen met me as promised at the station, having sent me a photo of herself and then we proceeded to have a rare old adventure to find the conference centre, which entailed going through narrow flooded country lanes and into the middle of nowhere!! Good job Helen had a 4×4! 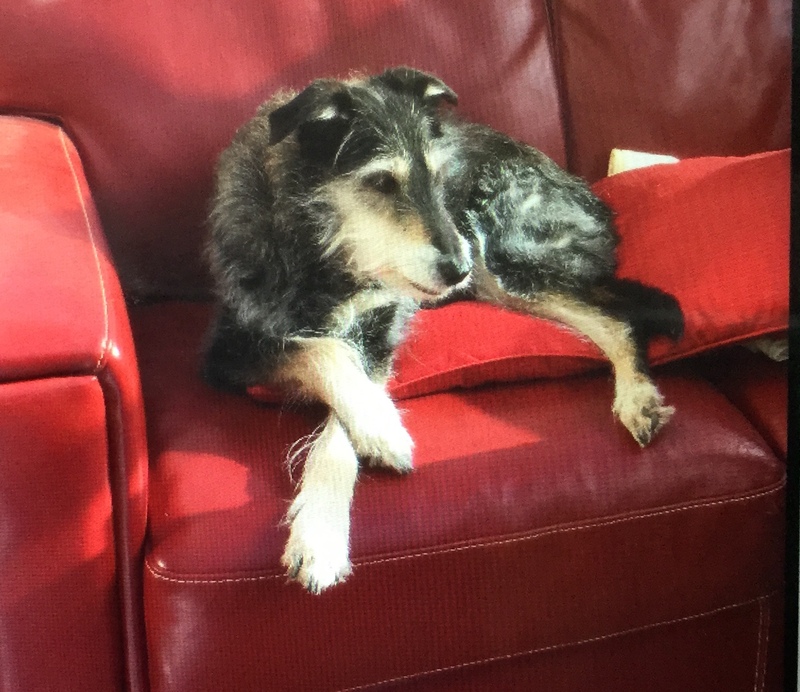 We chatted happily in the car and Helen has a therapy dog which she takes into Care Homes and a children’s hospice – Sasha………….very jealous……. We joined at the start of the afternoon plenary so we could see the venue etc. I didn’t want to type about the content as it wasn’t a public meeting and I didn’t want to put people off chatting by having my ipad open!! 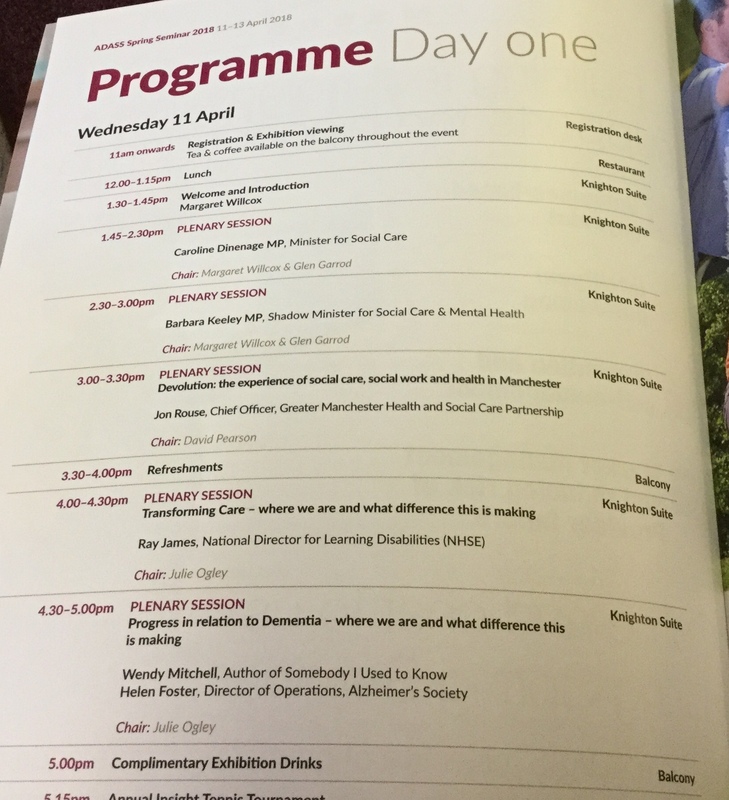 As you can see from the programme below, the first speaker of the afternoon was the Minister for Social Care. the second was the Shadow Minister and the third was Jon Rouse from Greater Manchester Devolution area……after a much needed cuppa, there was Ray James, National Director of Learning Disabilities who began with a short video by 2 people with learning disabilities who basically told those present to ‘Get on with it’…..wonderful! It was finally my turn. The audience had reduced but not by many and the room was still relatively full. Helen introduced me after stating some facts and figures about dementia. “In the next 5 years huge social care change must take place so that in 10 years time, we’re proud of what the country has in place. People living with cancer aren’t shoe horned into inappropriate treatment, those recovering from a stroke aren’t shoe horned into inappropriate treatment….so why are people with dementia? Dementia lags behind in medical innovation so the need for social transformation is greater. I may spell words wrongly. I have started a DA A in Oswestry & District and also run trailblazerz every Friday morning. I am a Dementia Champion and attend meetings here and there. I am busier than ever since I was diagnosed about three years ago. My upset is having to worry about keeping my driving licence in September. I am so pleased I have began writing on Twitter. Just finished reading your book Wendy. I would like to congratulate you on writing such an excellent book. It was so well written so interesting, I didn’t want it to end. just thought I would let you know your interview was on australian t.v. last night. It was great to see you in your house. your blog and book are very inspiring. Well done Wendy and thank you, for both taking this opportunity on and then telling everyone about it. Hello Wendy, you are amazing. I am so pleased you are knocking on the door of people who have the power to change things! As the “learning difficulties” group said…. “they had better get on with it”. Well done you, again! What a Champion…marvellous!